[Update 8:16 p.m. Sunday] By 8 p.m., Tropical Storm Irene had maximum sustained winds of 50 mph and its center was about 20 miles south of St. Johnsbury, Vermont, nearing the U.S.-Canadian border, the National Hurricane Center reported. Irene first made U.S. landfall at 7:30 a.m. Saturday in North Carolina, then paralleled the East Coast, and slammed into Little Egg Inlet, New Jersey, as a Category 1 hurricane around 5:30 a.m. Sunday, said the National Hurricane Center said. [Update 8:03 p.m. Sunday] "Conditions continue to worsen dramatically" in Vermont's capital of Montpelier, city manager William Fraser said Sunday night, noting National Weather Service warnings that the rising river waters will cause "major flooding" downtown as they crest at 18 feet early Monday morning. "A major emergency is on the horizon in Montpelier and is already occurring in other communities in the region," Fraser said. Mark Bosma, a spokesman for the state's emergency management division, described conditions as "awful" in many parts of the Green Mountain State with "some small towns ... entirely covered with water." [Update 7:59 p.m. Sunday] More details of Monday's reopenings of the three major airports around New York City: John F. Kennedy and Newark Liberty airports will reopen to arrivals only at 6 a.m. ET on Monday. Departures will begin at noon ET Monday, according to the Federal Aviation Administration. LaGuardia airport will open to arrivals and departures at 7 a.m. ET Monday. There were no incoming or outgoing flights Sunday out of the five New York-area airports - John F. Kennedy, LaGuardia, Newark Liberty, Teterboro and Stewart - operated by the Port Authority of New York and New Jersey. That meant there were "thousands of flights canceled, with 150 to 200 people a flight," said agency spokesman Steve Coleman, speculating that "probably tens of thousands of people" are affected. Find out more about the airports, subway systems, railways and ferries affected by Irene. [Update 6:55 p.m. Sunday] The U.S. Navy is sending three amphibious ships towards the New York and New England region in anticipation that the ships may be called upon to assist civilian authorities responding to Hurricane Irene, according to a Navy spokesman on the USS Wasp. [Update 6:49 p.m. Sunday] Four people have died in Pennsylvania as a result of what is now Tropical Storm Irene, Ruth Miller, a spokeswoman for the Pennsylvania Emergency Management Agency, said Sunday. This is the first report of Irene-related deaths in Pennsylvania that CNN has made. 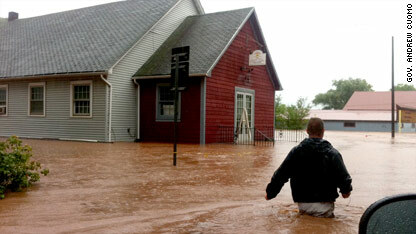 This puts the number of U.S. Irene-related deaths to at least 19 in seven states. Authorities say it has caused at least $1 billion in damage. [Update 6:26 p.m. Sunday] The three major airports around New York City - Newark Liberty in northern New Jersey, plus LaGuardia and John F. Kennedy in the New York City borough of Queens - will reopen Monday morning, the Federal Aviation Administration said. "Many Americans are still at serious risk of power outages and flooding, which could get worse in coming days as rivers swell past their banks," Obama told reporters outside the White House. "So I want people to understand that this is not over. Response and recovery efforts will be an ongoing operation, and I urge Americans in affected areas to continue to listen for the guidance and direction of their state and local officials." "I do want to underscore that the impacts of this storm will be felt for some time," he added. "The recovery effort will last for weeks or longer. Power may be out for days in some areas, and we will support our state and local partners in every way that we can as they work to restore power in those areas. "So I’m going to make sure that (the Department of Homeland Security) and (the Federal Emergency Management Agency) and other federal agencies are doing everything in their power to help folks on the ground." After Obama spoke, Homeland Security Secretary Janet Napolitano stepped to the podium and pledged that the federal government will assist states responding to or recovering from the storm. "I urge all Americans to take prudent steps to stay safe," she said. [Update 5:07 p.m. Sunday] U.S. President Barack Obama said Sunday that the impact of Hurricane Irene "will be felt for some time." Affected East Coast residents still are at risk of power outages and flooding, he said. Speaking to reporters outside the White House, he thanked emergency responders for their efforts. "We continue to have search and rescue personnel on alert," the president said. [Update 4:48 p.m. Sunday] In its latest advisory issued just before 5 p.m., the National Hurricane Center reported that Tropical Storm Irene's maximum sustained winds have dropped to 50 mph as it moved north-northeast at 26 mph. The center of the storm was located about 65 miles south of Rutland, Vermont, the center said. [Update 4:22 p.m. Sunday] Conditions in parts of southern Vermont are "awful" due to significant flooding, state emergency management spokesman Mark Bosma said. "Some small towns were entirely covered with water. We got reports of people stranded at schools and in cars," Bosma said. "One woman was swept away in a river. Water is pretty much everywhere." [Update 4:17 p.m. Sunday] More on President Barack Obama's planned 5 p.m. statement on Irene: He is expected to thank emergency responders for their work during the storm and provide an update on conditions, a senior administration official said, according to CNN's Dan Lothian. He'll urge people "to continue to be vigilant," the official said. The official added that "some in the Northeast still have a dangerous tropical storm to deal with." "Other hazards like inland flooding and downed power lines are out there. We're not out of the woods just yet. And, we still have a big clean-up job ahead," the official said. [Update 3:31 p.m. Sunday] A mandatory evacuation in New York City's low-lying Zone A (see map) coastal areas and the Rockaways was lifted at 3 p.m. after the worst of what is now Tropical Storm Irene passed, city officials say. New York City Mayor Michael Bloomberg had ordered some 370,000 people in the city to evacuate their residences. [Update 3:27 p.m. Sunday] U.S. President Barack Obama will make a statement about Irene from the White House Rose Garden at 5 p.m. today, the White House said. [Update 2:16 p.m. Sunday] Irene knocked out power to more than 4 million customers as it made its way north along densely populated cities on the East Coast. Utility companies and emergency agencies reported outages early Sunday, and warned that the numbers are expected to go up as the storm swirls north. [Update 2:04 p.m. Sunday] Tropical Storm Irene maintains winds of 60 mph as its center moves over southern New England, the National Hurricane Center said in its 2 p.m. ET advisory Sunday. [Update 1:51 p.m. Sunday] New York Gov. Andrew Cuomo said Long Island and the Catskill areas were still seeing lots of flooding and warned that the storm's impact is not yet over. Gov. Cuomo took this photo of storm damage near Margaretville, N.Y.
“This storm is not done with us yet,” he said, noting that the ground is saturated and power is still a problem. “We’re going to be dealing with this for days." He warned New Yorkers that while it may not be raining, there will be residual problems to deal with. And if New Yorkers decide to go out they could end up finding themselves in danger if rivers crest or power lines fall. [Update 1:27 p.m. Sunday] The evacuation order for parts of New York City will be lifted at 3 p.m. ET Sunday, Mayor Michael Bloomberg said. [Update 1:26 p.m. Sunday] Virginia's governor Sunday urged state residents to take caution in the aftermath of Hurricane Irene, warning that flooding, downed power lines and debris still posed hazards to people moving around. Irene left four people dead, all killed by falling trees, and knocked out power to about 1.1 million people, Gov. Bob McDonnell told reporters Sunday afternoon. A large share of the outages were in the Richmond area, where McDonnell said 364,000 customers - about three-quarters of the city - lacked electricity. Some parts of inland southern Virginia saw 16 inches of rain, while top winds were clocked at 83 mph as the storm scoured the Virginia coast on Saturday. "Undoubtedly, there will be more reports of damage, of injuries, perhaps fatalities," he said. McDonnell noted that after 2003's Hurricane Isabel, half of the deaths happened after the storm as people moving about hit live wires, drove into unexpectedly high water or were injured by chainsaws while trying to clear away fallen trees. Health Commissioner Karen Remley added, "If you're not used to chopping down trees, today isn't the day to learn." Evacuation orders were being lifted and all tunnels around the Norfolk area were open again, but about 240 roads remained closed around the state, officials said. [Update 12:48 p.m. Sunday] CNN's David Mattingly is reporting that 2,500 people are stranded on Hatteras Island, North Carolina because of damage caused by the storm. "Officials are looking to see how quickly they can repair roads," he said. Mattingly reported that these people decided to stay behind and ignore mandatory evacuations in the area. Officials say if the roads are going to be impassable, they will be able to have a ferry available on Monday to help get supplies to people or get people out of the area. Mattingly adds that many of these folks have plans in place and have dealt with this kind of situation before. [Update 12:17 p.m. Sunday] Record flooding is expected in coming days along the Ramapo River in the Pompton Lakes area of New Jersey, Gov. Chris Christie said Sunday. [Update 12:13 p.m. Sunday] Two people have died in New Jersey as a result of Hurricane Irene - a woman killed when floodwaters swept away her car, and a firefighter attempting a water rescue, Gov. Chris Christie said Sunday. [Update 12:03 p.m. Sunday] Emergency officials said at least 13 people across the United States have died as a result of Hurricane Irene - one each in Connecticut, Maryland and Florida, six in North Carolina and four in Virginia. [Update 11:44 a.m. Sunday] Rivers in New England could see record flood stages as Tropical Storm Irene moves northward toward Canada, National Hurricane Center Director Bill Read told reporters Sunday. [Update 11:39 a.m. Sunday] Tropical Storm Irene remains "large and potentially dangerous" as it moves inland, Homeland Security Secretary Janet Napolitano said Sunday. Though Tropical Storm Irene remains dangerous as it moves into New England, "the worst of the storm has passed," Napolitano said. [Update 11:24 a.m. Sunday] The North Tube of the Holland Tunnel, which had been closed earlier due to flooding, has been reopened by The Port Authority of New York and New Jersey. The George Washington Bridge's lower level, and the Palisades Interstate Parkway ramp to the bridge, which were also close, are now open. [Update 11:17 a.m. Sunday] Tropical Storm Irene now has maximum sustained winds of 60 mph, the National Hurricane Center said in its 11 a.m. ET advisory Sunday, but it warned of "an extremely dangerous storm surge" along some northeastern states' coastlines. The center of Irene is inland over southeastern New York state and southern New England, and will move over northern New England later Sunday and over eastern Canada Sunday night, the NHC said. "An extremely dangerous storm surge will raise water levels by as much as 4 to 8 feet above ground level from western portions of Long Island island Sound eastward along the southern coasts of Connecticut, Rhode island and Massachusetts." The surge "will be accompanied by large, destructive, and life-threatening waves," the NHC said, adding that water levels along the New Jersey and Delaware coast, including Delaware Bay, will subside Sunday. [Update 11:07 a.m. Sunday] Hurricane Irene will leave billions of dollars in damages in its wake as it continues to move up the East Coast, CNNMoney.com reports. According to the most recent government model, projected economic loss from wind damage alone is forecast to top $1 billion. That's less than earlier estimates that topped $2 billion but it does not account for flood and other storm damage. [Update 11:06 a.m. Sunday] Tropical Storm Irene now has maximum sustained winds of 60 mph, the National Hurricane Center said in its 11 a.m. ET advisory Sunday. The center is inland over southeastern New York state. [Update 10:43 a.m. Sunday] New Jersey Gov. Chris Christie asked residents that evacuated to wait and not return home until he and the rest of the government can make sure it is safe.
" Have a little patience, allow us to go down there first," he said. "I have no interest in keeping people away from their homes a minute longer than I have to. I want to get you there as quickly as I can, but I want to make sure you will be safe." 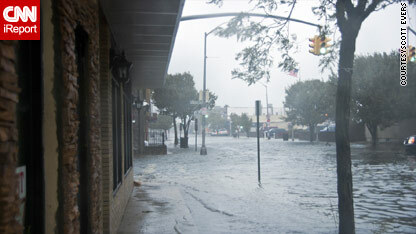 Downtown Millburn, New Jersey is underwater after Hurricane Irene moved through the city. Christie added that New Jersey still would see some more impact from the bottom part of the storm, so they aren't in the clear yet. "Let's not make a mistake on the tail end here," he cautioned. "Let's not do it by doing something stupid at the end. As soon as I can I will give the all-clear sign to people to go home." [Update 10:43 a.m. Sunday] CNN's Chad Meyers explains that New York may see a bit more wind and rain as the center of the storm moves away and the outer bands pass through. "Whats over now is the storm surge, that was the big concern," Meyers said. He explained the major concern was that the maximum surge would align at the time of high tide, which would have likely made the waters high enough to go into the subway and also make it's way to the World Trade Center site in New York City. He said while the main part of the storm had passed New York City, residents should expect to still see some storm conditions for the next few hours. [Update 10:34 a.m. Sunday] Residents in Newport, Rhode Island are beginning to feel the the brunt of the storm. Although the storm is considerably weaker than predicted, CNN's Gary Tuchman reports the resort city is waiting to see how it will be impacted by Tropical Storm Irene. “This is a very vulnerable city because the beaches face toward the south,” he said. That's the same direction the storm is coming from, Tuchman said. The city already is under some mandatory evacuations. [Update 10:22 a.m. Sunday] CNN’s Anderson Cooper, reporting from Battery Park in New York, says that the flooding there is receding and it is no longer raining. "The winds have also died down," he said, noting that New Yorkers were beginning to come out of their homes as the weather appeared to get better. He said the Holland Tunnel has also reopened. [Update 10:22 a.m. Sunday] CNN Weather's Chad Meyers explains that New York City may have gotten lucky - at the expense of North Carolina. Meyers said after Irene battered North Carolina, the storm never really picked up steam again and packed the punch that it expected in New York. He explained that if North Carolina was not in the storm's path it could have likely hit New York as a Category 3 storm. For now, he said, it appears New York has been spared the major damage that was expected based on earlier predictions. [Update 10:13 a.m. Sunday] CNN's Soledad O'Brien reports from the West Village that much of the flooding in the area has now receded. “Earlier we saw the banks of the Hudson overflowing,” she said. An apartment building that had water flooding the lobby now was also seeing water recede. [Update 9:57 a.m. Sunday] The New York State Thruway north and southbound between Exits 12 (West Nyack) and 17 (Newburgh) is closed due to flooding, according to NY Governor Andrew Cuomo. Southbound traffic should exit at Exit 17 and northbound traffic exit at Exit 12. [Update 9:48 a.m. Sunday] The East River is no longer topping its banks in Lower Manhattan as the tide turns and Tropical Irene moves north. [Update 9:31 a.m. Sunday] The FDR Drive is closed in both directions at Houston Street in Manhattan due to flooding conditions, according to NYC officials. Extensive traffic delays are expected. [Update 9:31 a.m. Sunday] People should "stay inside, stay safe" and "let the power crews do their jobs" as Hurricane Irene continues to move north, the head of the Federal Emergency Management Agency told CNN on Sunday. "For a lot of folks, the danger still exists," FEMA Administrator Craig Fugate said. "We still will have trees coming down, heavy rain, strong winds." [Update 9:24 a.m. Sunday] People who were forced to evacuate due to Hurricane Irene should only return to their homes when local officials say all is clear, the administrator of the Federal Emergency Management Agency said Sunday. Craig Fugate also told the NBC program "Meet the Press" that some of the hundreds of thousands of people who lost power during the storm may not get their electricity restored for days. [Update 9:19 a.m. Sunday] Rhode Island is now experiencing heavy rain and high winds, according to CNN staff on scene. "61 thousand families are without power, and pretty much every community is affected," said Christine Hunsinger, spokesperson for the Rhode Island Emergency Management Agency. evacuation zones." She says they do not anticipate widening the evacuation zones any more, but that it is a local decision. [Update 9:18 a.m. Sunday] New Jersey Governor Chris Christie warned residents to still remain inside from the wrath of Irene. He noted that even though Irene is now a tropical storm, there are still a lot of flooding concerns. He said that rivers were swelling to record levels and the state has closed over 250 roads and there are 15,000 people in emergency shelters. 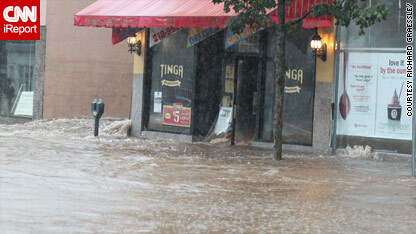 "Our real concern is flooding," Christie said. "We’re talking about not only coastal flooding, but inland." [Update 9:07 a.m. Sunday] Irene has weakened to a tropical storm with 65 mph winds. [Update 9:06 a.m. Sunday] CNN's Rob Marciano is reporting from Long Beach, New York that in the last ten minutes the wind has shifted and the area is seeing the "most intense weather" so far. The ocean and Reynolds Channel have met in the streets of Long Beach and the storm surge has done significant damage. “We are getting whats left of Irene’s right eye wall,” Marciano said. "Winds have been sustained, easily at 50 mph where we stand with much, much higher gusts. The water as you can see behind me has been relentlessly pounding the shoreline." [Update 9:00 a.m. Sunday] The Massachusetts Bay Transportation Authority says it has shut down all modes of transit. MTBA website says shutdown will continue for the remainder of Sunday and Sunday night. [Update 8:59 a.m. Sunday] CNN's Soledad O'Brien reports that in lower Manhattan "tons of water" from the Hudson River has made it's way into the streets near the West Side Highway. “It is now flowing into the jogging paths," she reported. "We haven't gotten the brunt of the Hurricane yet." O'Brien said there are some concerns at apartment buildings in Zone A in Manhattan where flooding is pouring into some buildings. There are concerns elevators and power will go down soon and residents of the meatpacking district will be stuck. [Update 8:57 a.m. Sunday] The Port Authority of New York and New Jersey has now closed the north tube of the Holland Tunnel due to flooding, according to a statement. 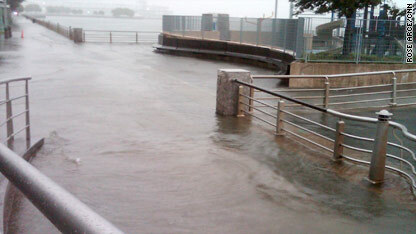 [Update 8:34 a.m. Sunday] The Hudson River is causing some flooding in the West Village, CNN's Phil Han reported. Han said part of 10th Avenue has been blocked off and two cars just got stuck in the water. The river is also covering parts of the pier and the river is breaching the area near the New York Department of Sanitation. [Update 8:20 a.m. Sunday] CNN's Soledad O'Brien and Senior Producer Rose Arce report the Hudson River has overflowed its banks in lower Manhattan with flooding occurring as far as a block inland in the city's meat packing district. [Update 8:02 a.m. Sunday]Irene remains a Category 1 hurricane with maximum sustained winds of 75 mph, the National Hurricane Center said in its 8 a.m. ET advisory Sunday. It is "forecast to weaken and become a post-tropical cyclone by tonight or early Monday," the NHC said. On the forecast track, the center of the storm will move near New York City Sunday morning and move inland over southern New England by Sunday afternoon, then move into eastern Canada Sunday night, the National Hurricane Center said. [Update 8:00 a.m. Sunday] The East River in New York City is topping the edge of its barrier wall, CNN's Ali Velshi reports from river overlook. Rob Marciano in Long Beach, New York, screams to report over massive surf and high winds. The life guard building appears to have been ripped off its foundation. The streets of Long Beach are flooding. Meteorologist Jacqui Jeras said tropical force winds will continue throughout the area for the next two hours. By Saturday evening, the storm had already knocked out power in more than a million homes, forced more than a million people off the New Jersey shore alone and caused at least 10 deaths. [Update 5:50 a.m. Sunday] Hurricane Irene makes second landfall near Little Egg Inlet, New Jersey, at approximately 5:30 a.m. Sunday. Irene's intensity was estimated at 75 mph. [Update 5:11 a.m. Sunday] Nearly 3 million customers across the East Coast are without power as Hurricane Irene churns northeast. Utility customers warned that the numbers are expected to go up as the storm swirls north. [Update 5:06 a.m. Sunday] The National Weather Service issued a tornado warning for New York's Nassau and Suffolk counties until 5:15 a.m.
[Update 4:40 a.m. Sunday] Ocean City, Maryland, appears to have endured Hurricane Irene without sustaining major damage, CNN's Jeanne Meserve said early Sunday. While there is some standing water, there is no major flooding, she said. [Update 3:59 a.m. Sunday]About 743,000 customers in Maryland are without power due to storm conditions, according to a spokeswoman for the state's Emergency Management Agency. About 31,000 customers in Washington, D.C. are without power, Pepco said. [Update 3:16 a.m. Sunday] A nuclear power reactor automatically went offline late Saturday in Calvert Cliffs, Maryland, due to strong wind gusts from Hurricane Irene, said Mark Sullivan, spokesman for the Constellation Energy Nuclear Group said. "The facility is safe; there is no impact to employees or our neighbors, Sullivan said. "There is no threat." [Update 2:22 a.m. Sunday] Authorities are no longer sending vehicles to respond to 911 calls in Ocean City, Maryland, because of high winds. By 2 a.m., the city had received 11 inches of rain. [Update 2:04 a.m. Sunday] Irene remains a Category 1 hurricane with sustained winds of 80 mph and gusts to 100 mph, the National Hurricane Center said in its 2 a.m. advisory. Storm is about 15 miles south-southeast of Ocean City, Maryland, and about 195 miles south-southwest of New York City. [Update 1:38 a.m. Sunday] All service is now suspended on the Staten Island Ferry, according to New York officials. [Update 1:20 a.m. Sunday] A Queenstown, Maryland, woman died Saturday after a large tree knocked a chimney through the roof of her home, crushing her, according to Kevin Aftung, the chief of emergency services for Queen Anne's County. [Update 12:47 a.m. Sunday] Georgetown University in Washington, D.C., reported damage late Saturday at the construction site for its new science center, according to communications officer Maggie Moore. [Update 12:23 a.m. Sunday] Officials in Maryland warned of potential failure of the St. Mary's Lake Dam due to heavy rains from Hurricane Irene. Government officials warn the storm could cause significant flooding that could threaten people, homes and roads downstream from the dam. [Update 12:23 a.m. Sunday] Ocean City, Maryland, received 8 inches of rainfall by early Sunday and was experiencing minor flooding, said Bob Rhode, operations chief of the city's Emergency Management. [Update 11:40 p.m. Saturday] U.S. President Barack Obama has signed a disaster declaration for Puerto Rico in the aftermath of Hurricane Irene. The declaration frees federal funds to help in the recovery effort, according to the White House. [Update 11:20 p.m. Saturday] The Southeastern Pennsylvania Transit Authority closed down late Saturday because of a tornado warning in Philadelphia, according to SEPTA representative Jerri Williams. [Update 10:47 p.m. Saturday] The National Weather Service has issued a tornado warning until 11 p.m. ET for the city of Philadelphia, including east-central Chester County, northeastern Delaware County, central Philadelphia County and southeastern Montgomery County. [Update 10:37 p.m. Saturday] New York Mayor Michael Bloomberg, addressing reporters Saturday night, said residents should prepare to hunker down as Hurricane Irene approached. "The storm is finally hitting New York City," he said. [Update 10:26 p.m. Saturday] The National Weather Service has issued tornado watches - extending through 5 a.m. Sunday - for parts of southern Delaware, eastern New Jersey, southeastern New York and Long Island and southwestern Connecticut. [Update 9:52 p.m. Saturday] A tornado touched down in Lewes, Delaware, damaging at least 17 homes, the governor said Saturday night. just asking because i am not from r.i. its just happen that i have a family there and we havent commjunicate with them since yesterday. In the country about an hour's drive north of NYC, there are often power outages during winter storms. It's good to have a generator, as well as a stockpile of food, because being snowed in is a (beautiful) reality of life. There's always enough warning time to get into the city if you have to be there. PS: This survey will take less than 10 minutes and we will share the results with you via an update on this page. Thanks for your help! Every storm damage victim should go through such information, so that they can restore their property properly and can minimize the risk of further damages, checking your insurance policies and license and background of the contractor is also very necessary, as these could prove as benchmarks in restoration of your property. news.blogs.cnn.com is wonderful. There's always all of the ideal info in the ideas of my fingers. Thanks and keep up the excellent work!